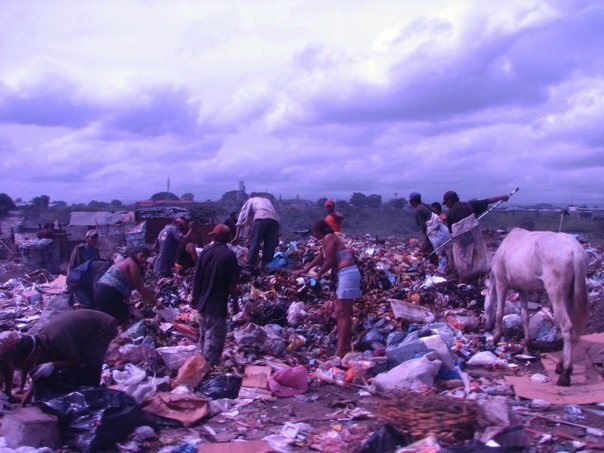 No mission trip I’ve ever made to Nicaragua has been complete without a visit to La Chureca (the city dump in Managua). Over the last seven years I’ve made numerous trips there to get a better picture of “the least of these.” The numbers are continually changing, but there are well over 1,000 people, with a majority percentage of children, who call La Chureca home. The Buzbees have a long standing ministry presence there – caring for the sick and malnourished and also educating the children in their school. So this morning, we all loaded up the van with the whole Buzbee clan to visit the school for their Christmas party. Even though I had just visited in August, I was amazed at the transformation that is taking place there. The government of Spain has taken on the project of taking a census of the residents, building temporary housing in preparation for the final goal of moving every resident out of the dump to a new housing area. They are even transforming the mountainous piles of burning rubbish into a modernized facility complete with recycling. However, the drive to the school is still the same – a narrow dirt road, lined with houses made of scrap metal and plastic sheeting. The stench of burning tires and trash is still overwhelming. Children with open sores and rag-tag clothing are out either rummaging through the trash or playing in it on the streets. But today was different. There was hope. We pulled up to a mass of children and their families waiting to enter the school. The Christmas party offered a respite from the daily routine. For a brief period of time you almost forgot that you were in a dump. Christmas music was playing, the children were performing in their program, presents were wrapped and ready to hand out and everyone was seated at tables with white table cloths waiting for a catered lunch. Hope. It’s what this advent season is all about. We celebrate the arrival of Hope. Hope that came in the form of a baby boy born to a young, rural, virgin girl named Mary. A Savior called Immanuel – God with us. Jesus. He would enter our dump and bring hope. He would walk through the refuse, sickness and disease that our sin created and offer life. Life that only is available because He gave His life for ours. Rescued. Ransomed. Redeemed. You don’t have to stay in the dump. As C.S. Lewis says, “He [God] offers us a holiday by the sea.” An open invitation. A free gift. The best gift you will ever receive this Christmas! Are you ready to move out of the dump?